The usual diagnosis of croup does not require imaging. The diagnosis can very well be made only by history and the sound of ‘barking seal’ cough. However, on certain occasions the child is exhausted by the respiratory distress and the cough may not be heard because of the poor effort. Radiology helps in ascertaining the diagnosis in these cases. 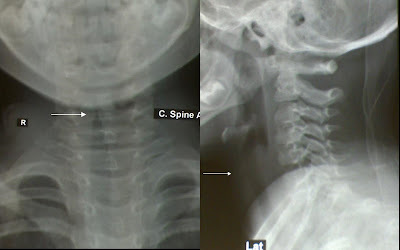 In AP view of x-ray soft tissue neck, a ‘pencil tip’ appearance of subglottis is seen. In lateral view of x-ray soft tissue neck the usual demarcation of ventricle can’t be made and the area of glottis and subglottis has a hazy appearance, suggesting mucosal edema.